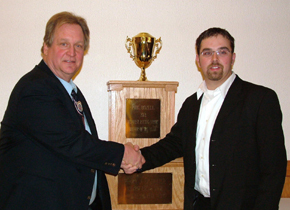 Home » 2012 Minutes » 46th Annual MARFC Banquet updates! 46th Annual MARFC Banquet updates! Our President’s Award went to Dr. Robert Hubbard, the individual responsible for designing and developing the HANS Device. Bob shared with us what it was like in the early days of development and stories of some of the places and people He has been blessed to work with due to the advent of the HANS Device. He also shared with us just how much of the development and creation of this lifesaving device was done right here in Michigan, which reminds us all of how big a role the State of Michigan plays in all of Auto Racing. 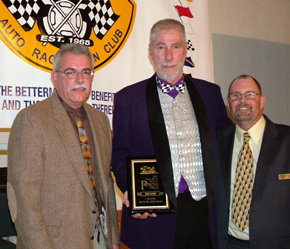 Bob Varney represented the four generations of the racing Varney family that was in attendance to receive the MARFC/Eddie Sachs Jr. Memorial Lifetime Achievement Award for their over fifty years of activity in the sport and for the contributions that all of the Varney’s together as a family have made. 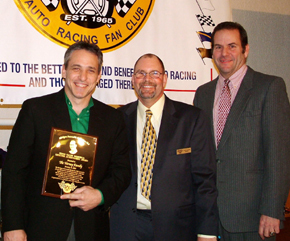 The MARFC Media Award was presented to the SPEED TV Program NASCAR Raceday. Unfortunately with the Hall of Fame inductions in Charlotte the same weekend, representatives of SPEED TV were unable to attend although a nice acceptance was recorded by cast member John Roberts. 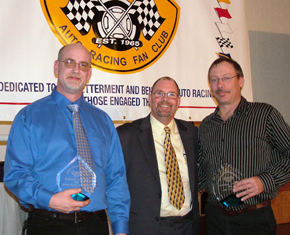 Tri-City Motor Speedway owners Steve and Denny Puvalowski were very surprised and honored to be presented with the MARFC Promoter of the Year Award. These two gentleman have done an excellent job bringing a track back to life that for all accounts and purposes was dead. In listening to their acceptance it is very clear that these two fellows have an excellent work ethic and are here for the long haul. Jim Gullett of Jim’s Industrial Catering helped present the award that he sponsors in memory of longtime Toledo and former Mt. Clemens Promoter Sonny Adams. The MARFC Mechanic of the Year Award went to two individuals this year, Kirk Reinbold and Chris Metdepenningen were recognized by the Board of Directors for their accomplishments not only in 2011 but over the years leading up to their championship seasons. 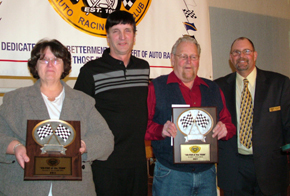 Co- Fans of the Year for 2011 are Barry Meschke and Nancy Rathbun. Both of these individuals helped out at numerous events this past summer even to the point of taking on an event on their own. Their individual contributions are immeasurable and once again this award was sponsored by Jim’s Industrial catering in memory of “Big Jim” Gullett. Both Barry and Nancy were surprised and honored. MARFC Appreciation Awards were given out to Greg Hillman of Pettipren distributors for their many years of continued sponsorship of the banquet with the many Budweiser items given for the door prize giveaway. Jim Gullett was honored for his years of sponsoring the Fan of The Year award and most recently the Promoter of the Year as well as his donations so that the MARFC Children have a great Christmas Party. Laura Tucker was recognized for her many years of service as Board Member and for the work she has done for the Kid’s Christmas Party and many other functions the club has taken part in. An appreciation award was presented to the Michigan Speedway promoters Association in recognition for all they do as an organization to continue to promote and grow Auto Racing in the State of Michigan. Michigan is truly unique as no other states have an organization such as this that draws nearly every track owner in the state to meet twice yearly and work together for the betterment of the sport. MARFC is an associate member and attends these twice yearly meetings. The last appreciation award was given to my First Lady, Julie DeHem. While she is my wife and my partner, she helps me out every month with the newsletters and with different mailings that go out each year as well as making the trip to the printer each and every time we have something ready to go out. In addition she helps me clean up before and after Board Meetings at our home. As far as I can see, anyone who holds the office of President of MARFC needs to have a good partner at home to be able to do what we need to do to tend to the different functions and tasks the job of President entails. 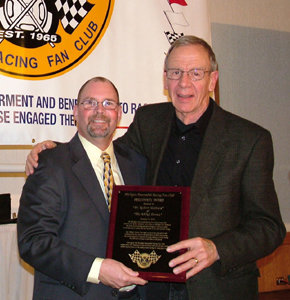 Ron Drager presented the Michigan Speedway Promoters Association (MSPA) Promoter of the Year Award to a surprised and grateful Ron Flinn and the Crystal Motor Speedway. 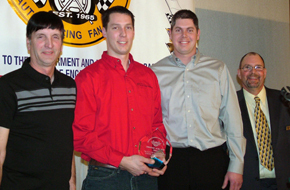 Ron, like last year’s winner, Jim Leasure, was very quick to say that it isn’t just He who makes Crystal Motor Speedway a great place to be, it is the staff that works so hard with the drivers and fans to make it a great place to be on Saturday nights and said that this award was as much theirs as it his. Terry Fitzwater was on hand to present the Henry J. Fitzwater Driver of the Year award to a very deserving Super Late Model driver Phil Bozell. 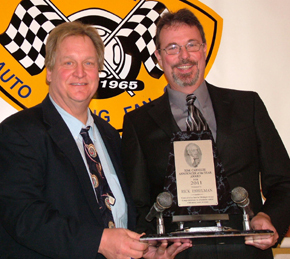 Terry also presented the Tom Carnegie Announcer of the Year award to the voice of the World of Outlaw Late Models, Rick Eschelman. Rick shared how honored He is to be selected for this award and spoke of his roots as a leading Michigan Announcer. Previous post From the Desk of the President for February! Next post The Presidents Thoughts for March!